One of the most famous free web hosting during my college life, heck one of the pioneers is finally going to heaven. 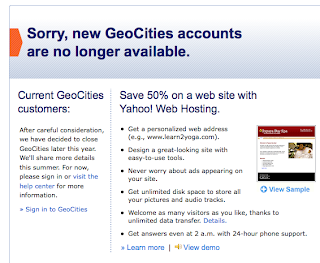 Geocities is being closed down by Yahoo! as Geocities' traffic has been falling over the past year. GeoCities, one of the original web-hosting services acquired by Yahoo! in 1999 for $2.87 billion will no longer accept new members and Yahoo! is encouraging the existing users to upgrade to a paid hosting. Sigh, we had good times with Geocities as I remember our college group website. I also suggest this free web hosting to my students when I was teaching web development. Well, everything has an ending and Geocities is finally going to rest in peace.